The most recent case for creative freedom is our work with the city of Upland. Over the past year, we’ve worked on two major projects for the city: the Upland Farmer’s Market and the Upland Lemon Festival. Advertising for farmer’s markets typically consists of a close-up shot of a fruit and/or vegetable along with the date, time and location of the market. These ads are safe, they tell you what you need to know but they aren’t memorable. They don’t stir up excitement. 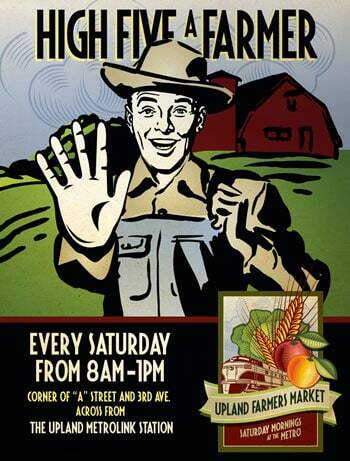 To promote the new Upland Farmer’s Market, we wanted to do something different from those fruit and vegetable images so we came up with the High Five a Farmer campaign. Through radio, television, print, direct mail, outdoor, social media and promotional giveaways, we encouraged people to support local farmers by buying food at the farmer’s market. Because the campaign emphasized the market as a community where local farmers are your friends, it made people want to go to the farmer’s market instead of a grocery store. Though the campaign was way different than the city’s past ad campaigns, Upland loved it and so did the target audience. People came out in record numbers during the market’s opening weekend in October and they’ve kept coming back ever since. This positive response is further proof that High Five a Farmer is not only creative but memorable too. 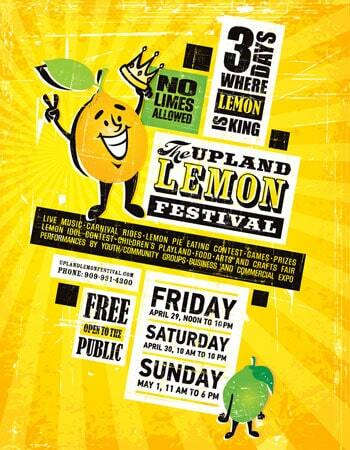 After the success of the farmer’s market, Upland asked us to help them create another memorable campaign, this time for the annual Upland Lemon Festival. Instead of giving them stock illustrations or photography of people having fun, we came up with the No Limes Allowed campaign, a campaign that focused on the lemon-lime controversy. Each ad features a smiling lemon and an unhappy lime. The lime is sad because he’s not a lemon – he knows the Upland Lemon Festival is three days where lemon is king and he’s dying to get in on the fun. Though the festival hasn’t happened yet (it’s April 29 – May 1), the ads have already generated a lot of buzz and excitement about the festival. We’re proud we got to do something different with this campaign, and more importantly, so is the client. The best way to jumpstart your company or brand is to leap out of your comfort zone. Mix it up. If you’re used to filling your ads with copy, do a campaign that’s visually-driven. If you’ve always advertised on the radio or on TV, why not try advertising on Facebook or a little SEO? Go with a concept that’s edgy, a concept that makes you a little uncomfortable – often, these concepts are the ones people remember.